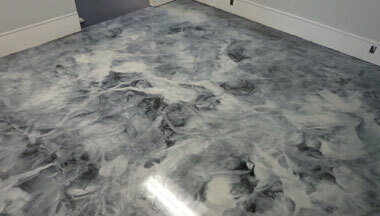 Pure metallic epoxy flooring is one of the hottest trends sweeping commercial, residential, and industrial spaces. These floors are resilient, one of a kind, and are quickly installed. Our concrete contractors in the Arkansas areas we service, provide cost-effective services to turn any floor from boring to fabulous. Whether you’re in the market for a new floor in your garage, in your home, office, retail space, or kitchen, give us a call. 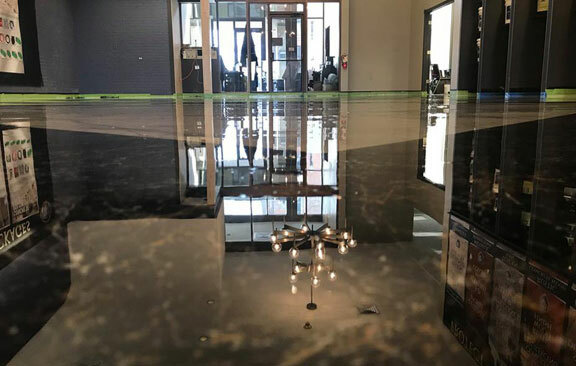 As the most professional metallic epoxy floor contractors in Arkansas, we are here to provide exceptional service at a low cost. Metallic epoxy is one of the most interesting installations our company does because it is unique to every customer. These floors cannot be duplicated even if installed by the same contractor because of how the floors are left alone to set. Epoxy flooring, in general, is very popular for any high traffic area because it protects against wear and tear, chemical spills, superficial scratches, and everyday foot traffic. Residential/Commercial/Industrial areas that are in need of an upgrade on a budget are easily transformed with metallic epoxy floors. Since these floors are easily customizable to your specifications, they can brighten any room in which they’re installed, making them great for high traffic areas. 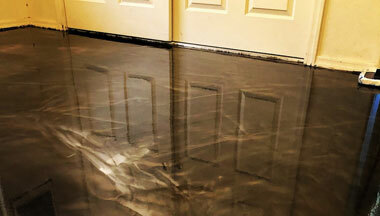 With extreme exposure possible in all of these spaces (residential, commercial, and industrial) metallic epoxy floor installation guarantees elegant, long-lasting floors. By choosing a metallic epoxy floor with us, you are paying low-end prices for high-end material and amazing service. If you have any questions about where your metallic floors should go or simply have underlying questions, we would love to hear from you. Whatever vision you have for your floor, we can make it a reality. Metallic epoxy floors are designed uniquely every time and cannot be copied. With glasslike floors, your space will become a bright and decorative area. Metallic floors are aesthetically beautiful and inexpensive in price, especially because they last for so long. You can have a combination of colors and designs on your floor, giving it the appearance of what you have envisioned in your mind. A metallic epoxy resin floor is resistant to even the most unconventional wear and tear you could think of. With a top layer protecting the concrete below, metallic floors can last for years to come, thus, saving you more money in the end. The floors also become resistant to chemical spills that would otherwise have the opportunity to seep through concrete pores and destroy the structure of the concrete. When you have less to worry about, like the foot traffic destroying your floors with constant harmful debris, you focus more on your home or business. 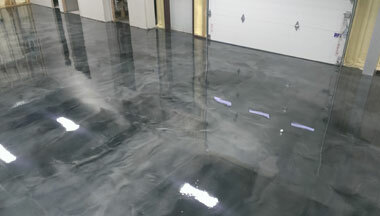 Metallic epoxy floors do not need to be deep cleaned, scrubbed, or maintained on a regular basis. If something out of the ordinary happens, you are always advised to clean up, such as harm spills, water, oils, grease, or chemicals. Ultimately a simple sweep up for loose debris is all that is recommended daily. When you sweep properly on a daily basis you reduce the possibility of abrasions that could harm your floors in the long run. The quality, elegance, and colors allotted by metallic epoxy floors outdo the low-price tag they have. These floors last for 10 to 20 years, if not longer, and are accredited to having some of the lowest prices for floor designs. Our company here in Arkansas knows how important budget-friendly but attractive floors can be for your home or business. Can a floor truly help keep you and your customers, family, and materials safe? You bet it can! Metallic epoxy can be made with non-slip qualities, they can regulate temperatures, and even help reduce the possibilities of fires. When you choose a metallic epoxy flooring system you are choosing a smooth and forgiving surface for machinery, that would otherwise be exposed to a harsher surface, forcing you to have to replace vehicles and machines more often. By installing a metallic floor, you are helping your wallet and the environment. We serve residential, commercial, and industrial clients looking to add a touch of elegance to their spaces. With more than 30 years of experience in the Arkansas area, we are the experts you want to call, today.